I find it ironic that water is one of the necessities that is in short supply after a hurricane. I mean you look at the news videos and there’s water everywhere, but of course it’s unusable. The answer, of course, is to keep a supply of drinkable water on hand for the short term and to have a way of purifying water for the long term. Clean drinking water is something that we pretty much take for granted is the USA, but let our public water purification facilities break down, and many of the age old enemies of mankind spring to life overnight. Dysentery, Typhoid, Yellow Fever, Cholera, and other diseases nearly always accompany a disaster that contaminates our water supply. That’s why it’s so important to store water. It’s part of my survival philosophy to never buy anything just for the sake of storing it. I only buy what I use and use what I buy. Food, water, gasoline, propane, medicine; I don’t care what it is; I rotate my inventory using the old and replacing it with new. This is the same approach that I take toward water storage. We have one of those upright water dispensers in our kitchen, the kind that holds a 5 gallon bottle of water. We use this water as our everyday drinking water, even though our well water is clear, cold, and clean. In addition to the bottle that is in the dispenser I keep 4 more bottles is a storage closet on the porch. When the bottle in the dispenser runs dry, we replace it with one from storage and get the empty refilled. Although you can survive on a quart of water a day, a half-gallon is more realistic for drinking and cooking; so I figure my 25 gallon back-up is good for 10 or 12 days anyway. By the way, don’t waste your money turning in the empty bottle for a full one. I did this at first and found myself paying 7 dollars a bottle after the trade in. Then I discovered that a nearby grocery store had a refill dispenser that runs local water through all kinds of filters and then squirts it out into your empty 5 gallon bottle. Since it only costs $1.75 to fill a 5 gallon bottle, I consider this the only way to go. If you live in the city and are happy with the public water supply, you can just take your bottles out in the back yard and fill them from the water hose. If you don’t have a water dispenser, or if you don’t have room to store 5 gallon water jugs; buy three or four cases of gallon jugs and store them under the bed or in the back of your closet. The only drawback to this method is that you have to make a conscious effort to use the water and keep rotating your stock. Even if you don’t have a formal water storage program, you probably have 20 to 30 gallons of water available in your house at all times. Your hot water tank will have about 20 gallons in it that can be drained out of the bottom faucet, and each of your toilet tanks will have about 5 gallons in the back reservoir (not the bowl). Don’t use the toilet water if you have put toilet cleaner tablets in the reservoir. If you feel uneasy about using water from the toilet reservoir, you can always siphon it out into a pan and boil it on the stove or use a chemical purification method (see below) to make sure that it is safe to drink. If you have any doubt at all about the safety of your drinking water it is best to take the time to purify it. Making water safe to drink consists of two processes: (1) filtration, to remove particulate matter from the water, and (2) purification to kill off any biological contaminates. Please note that neither one of these processes will remove chemical contaminants from water, so it is imperative that you start out with water that has not been contaminated by some kind of chemical spill. This is particularly problematic after events like a hurricane or widespread flooding where who knows what kinds of hydro-carbons, inorganic solvents, pesticides, heavy metals, etc. may have been washed into the water supply. So, we are assuming here that we are starting off with water that is free of chemical contamination. Filtration is a mechanical process for removing particles from water. The finer the filter medium, the smaller the particles that can be removed. No improvised filter will remove bacteria size particles, but it will remove most dirt, algae, leaves, etc. If you are at home you may have a filter system that you didn’t even think about; your coffee maker. If you have a coffee machine or a drip coffee maker you probably have a box of paper coffee filters. 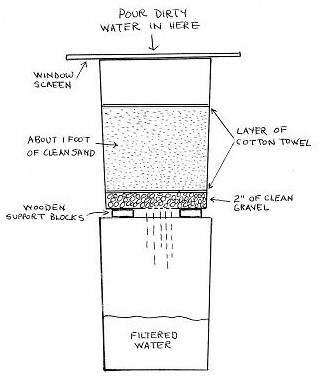 You can run muddy water through 2 or 3 of these filters and it will clean it up quiet a bit. Take one of the buckets and drill or punch about a dozen holes in the center of the bottom. Set this bucket (the filter bucket) on top of the other bucket (the catch bucket) using the two sticks or boards to keep the filter bucket from dropping down into the catch bucket. Place about 2 inches of clean gravel in the bottom of the filter bucket. Try to use gravel that is composed of rocks about 1/2 inch in size. Cut a piece of cotton towel that will fit into the bucket and cover the gravel. Cut the towel a little bigger than the bucket so that it completely covers the gravel and turns up the sides of the bucket a little. Now put about a foot of the cleanest and finest sand that you can find over the toweling. Try to find sand that has no humus or other organic matter in it. Now cut another piece of towel and place it on top of the sand. Finally, lay a window screen on top of the bucket. See the diagram below for a visual of how to set up this filter system. Now you are ready to filter water. Pour the dirty water into the top of the filter bucket. The window screen will remove leaves and twigs and pre-filter the water that goes into the bucket. As the water works its way through the sand, most of the solid materials will be filtered out. The relatively clean water will drip out of the holes in the bottom of the filter bucket and fall into the catch bucket. The first water that goes through your filter may be cloudy due to dirt in the sand and rocks, but this should clear up fairly quickly as you continue pouring water through the filter. CAUTION: YOUR WATER IS NOW FILTERED, BUT IT IS NOT PURIFIED. DO NOT DRINK THE WATER UNTIL IT HAS BEEN PURIFIED. We purify water to remove biological contaminants, like bacteria and amoebas, that can make us sick. There are three basic ways to purify water. These are: (1) boiling, (2) chemical purification, and (3) distillation. Of these three methods, boiling and chemical purification are the quickest and easiest. Distillation requires more time and more equipment and will be the subject of another post. Boiling water requires a fire proof container to hold the water and a source of heat. Simply bring the water to a boil for ten minutes then allow it to cool. Once the water has cooled you can pour it back and forth several times between two containers to re-oxygenate the water and improve its taste. If you are at a high elevation water will boil at a lower temperature, so you will have to boil it for a longer period of time to be sure that it is purified. There are several different chemicals that you can use to purify water. Commercial water purification tablets, like Halazone, are cheap to buy and easy to use. I keep a bottle of them in my truck, and another bottle in my pocket survival kit. Regular household bleach can also be used to purify water. Use about 16 drops of bleach (about 1/4 teaspoon) to a gallon of water, shake well, and let stand for thirty minutes. Tincture of Iodine can also be used to purify water by adding 8 drops per quart. Shake well and let stand for 20 minutes. Iodine is not recommended for long-term use and should never be used by pregnant women or persons with a thyroid condition. yep. what people tend to take for granted. – water is right near the top of the list. You covered alot of ground and reminding folks about the water that hangs out here and there in their home was good. I think about the covered up/not now being used well on the neighbor`s property and chose to stay on great terms with those folks. – with lots of hiking and bicycling out in the boonies, water was discovered as the enabler and the lack of it the limiter of most everything. – – – There are lots of makes of filters out there and some may be better than what a friend and I chose but he went with a prominent compact ceramic brand which also cost quite abit and found he was drinking brown water. The company told him not to worry about it that only the mud was getting through/not the bad stuff. Yea. – We now both have First Need Filters and bought a case of extra canisters. A rain barrel or ditch or puddle or swamp or whatever – the odds of great water went up with that move.